Leaders who create a shared sense of purpose and identity within their work teams can help improve employee health and wellbeing. The study also shows that leaders who create a shared sense of purpose and identity within their work teams can help improve employee health and wellbeing. Lead researcher Dr Niklas Steffens, from UQ's School of Psychology, said leaders played an integral role in helping employees to feel healthy and motivated. "Leaders who create a strong sense of 'us' and a sense of belonging within their teams help staff to feel more positive about their work," Dr Steffens said. "This feeling translates to increased levels of engagement. "Feeling part of a group affects an employee's sense of self-worth and increases their sense of achievement. "Our results show that mental health and performance are mutually dependent and can be improved through effective leadership," he said. Research team member Professor Alex Haslam, also from UQ's School of Psychology, said employee health and wellbeing were often viewed by employers as issues to be dealt with by individuals. "Many organisations have wellbeing programs that involve employees engaging in activities such as gym classes, stress relaxation or mindfulness courses," Professor Haslam said. "This research clearly illustrates that leaders in the workplace also have an important role to play in improving employee wellbeing. "Leaders can improve performance by helping their staff to identify with the group, its purpose and achievements. "This creates a win-win outcome for the organisation and the employee," he said. The study involved 641 adults employed in a range of mainly white-collar roles. Participants completed a survey in which they evaluated the leadership of their workgroup leader and reported on their health and wellbeing. "The sense of shared social identity created within a work group improved each employee's feelings of achievement and belonging while also reducing burnout," Dr Steffens said. "We have recently replicated these patterns in longitudinal research which confirms that leaders play an important role in nurturing the wellbeing of their teams." 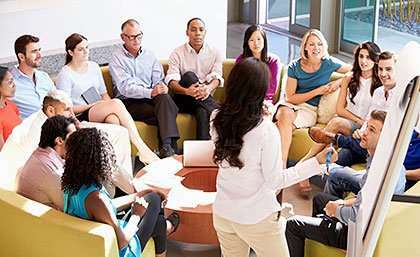 The study, published in the German Journal of Research in Human Resource Management, is part of an ongoing research program exploring the role of group processes in both leadership and health.